This Season's Flu: Worst in 10 Years |The Benefits Store Inc.
Every year, doctors recommend that their patients get a flu shot — and for good reason: there are different strains of flu that become prominent each year and that require different immunizations. This means that depending on the strains that are out there, some flu seasons are worse than others. That’s definitely the case this year, which is the worst flu season since 2009, which was the year of the swine flu pandemic. 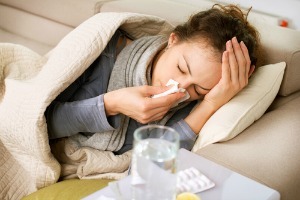 Americans falling ill with the flu is increasing. Additionally, hospitalization rate has increased as well. This number is important to predicting the death rate. According to the CDC (Centers for Disease Control and Prevention), this year’s flu season is about to equal the flu season from 2014-2015. During the 2014-2015 flu season, roughly 34 million Americans fell ill with the flu, 710,000 had to go to the hospital as a result and almost 56,000 died. The CDC also tracks the number of children that die as a result of the flu. It tracks these numbers individually as opposed to death totals, which it estimates. During the 2014-2015 flu season, there were a total of 148 child flu deaths. This year, there are currently 37. There are, however, still several weeks left in the flu season. The CDC often does not learn about flu-related deaths until a few weeks after the case. This is especially true with children who die at home from the flu. The flu pandemic in 2009 was historically bad because it was a new virus. This year’s flu season is dominated by the H3N2 virus (also known as the Hong Kong flu), which has been around for almost half a century. This year’s flu season has been one of the worst the country has seen in almost a decade. Although it’s at the tail end of the flu season, people who have not had their flu shots yet should still get them. To stay up to date with all the latest health news, be sure to visit us at The Benefits Store today.